Belgravia Gallery regularly hosts events and exhibitions in London and Surrey. We have two gallery spaces in the Surrey Hills, 30 miles from London, where art can be viewed by appointment or during one of our Private Viewings. Please sign up to our newsletter or contact us if you’d like to be informed of forthcoming events. We also hold special events in association with various organisations and charities such as Google, Villa Medici (Rome), American Express Centurion Card, Acuity Legal, Fine Wine Auction and Dinner (Action Against Hunger), The Sebastian Hunter Memorial Trust, amongst others. In addition to our events, we are happy to bring art to your home or office for you to view in situ. We organise installation of art by professional art installers when requested and can also arrange visits to artist studios. We are happy to work with you to transform your interior with art you will love each and every day. We look forward to welcoming you. Belgravia Gallery’s SPRING SHOW is now in full swing. The exhibition offers a diverse array of great artworks from artists such as Sir Peter Blake, Dion Salvador Lloyd & Nelson Mandela to exemplary contemporary sculpture by Sophie Louise White along with paintings by Jan Coutts & Rory Browne. New to our catalogue of artists – Jan Erika Design & Charlotte Aiken will display their bold and atmospheric works respectively. 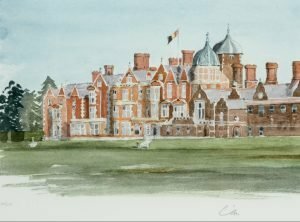 Belgravia Gallery is delighted to be exhibiting its collection of Royal Art at Cranleigh Arts Centre this June. An opportunity to view and acquire signed lithographs by HRH The Prince of Wales covering subjects such as the beautiful royal homes, Balmoral, Sandringham, Highgrove and Windsor Castle, together with landscapes of the Prince’s favourite places, including Yorkshire, Klosters and Scotland. In addition, Belgravia Gallery’s collection of Original Etchings from the 1840’s by Queen Victoria and Prince Albert, and paintings by their daughter, Princess Louise, which will be on show and for sale during the exhibition. These offer a rare insight into the early years of their marriage and cover subjects such as their dogs, children and love of Greek mythology. More recent photographs by Lord Snowdon will also be shown and vintage press photographs of Princess Diana and her children from the 1980’s.